Octanex N.L. (NSX:OCT) is an Australia-based company engaged in petroleum exploration and investment. The Company through its wholly-owned subsidiaries, holds working interests in 10 petroleum exploration permits and residual and royalty interests in a further three such permits, all situated in the offshore basins of Australia. Five of the permits in which interests are held by the Company are located in the Exmouth Sub-basin (WA-322-P, WA-329-P, WA-384-P, WA-385-P and WA-394-P), with a further four permits located on the Exmouth Plateau (WA-362-P, WA-363-P, WA-386-P and WA-387-P). Two of the permits are located in the Dampier Sub-basin (WA-323-P and WA-330-P), while the two remaining permits (EPP34 and Vic/P61) are located in the Otway Basin, offshore of South Australia and Victoria respectively. 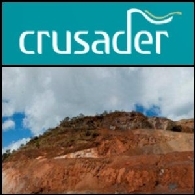 On March 9, 2009, the Company acquired Strata Resources Pty Ltd.
Laporan Pasar Australia 3 Februari 2011 memuat: Crusader Resources Limited (ASX:CAS) melanjutkan untuk memperluas mineralisasi yang diketahui pada Proyek Emas Borborema di Brazil; WPG Resources Limited (ASX:WPG) akan mendirikan joint venture dengan Evergreen Energy Inc (NYSE:EEE) untuk mengembangkan dan menjual Teknologi K-Fuel ke seluruh Australia; Xanadu Mines Limited (ASX:XAM) dan Noble Group (SIN:N21) membentuk aliansi strategis di Mongolia; Octane N.L. (ASX:OXX) akan memulai operasi pengeboran di lepas pantai Australia Barat.